The effective use of PowerPoint can really enhance training sessions and support a trainers development in lesson preparation. PowerPoint can be very interactive when used effectively and this training session is designed to support trainer development in the use of PowerPoint. Create presentations which enhance learning and learner involvement in training sessions. Save time setting up interactive presentations and design creative activities and quizzes to enhance the learner experience. 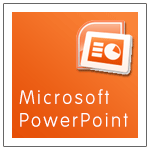 Use PowerPoint effectively for creating training notes and interactive training systems. Key-Strokes Training also offers a PowerPoint training course designed to boost techniques in creating a PowerPoint presentation. This is recommended if you are just starting to use the software.